There were two main reasons I picked The 7th Victim to read – Karen Vail and the profiling aspect of it that promised to play a major part of the story – that’s my Criminal Minds inner-fan getting excited at a book about profilers because I haven’t actually read a thriller involving profilers – ever. I’m actually kind of weirded out thinking that. However, what was most exciting was the depth of research and familiarity Alan Jacobson had with the FBI profiling unit or to be more accurate, the Behavioral Analysis Unit – there actually is a BAU! Karen Vail and The 7th Victim was the result of 7 years of research with the unit – which tipped me over the edge into reading the book. There are certain expectations when it comes to reading something that is the first of a series, and this book managed to turn all of those on their collective heads because, as Alan explains, this was never meant to the first of a series. You learn everything about Karen, and more. Karen herself is stubborn in her desire to capture the Dead Eyes Killer, but she’s also vulnerable and in trouble personally. More importantly, Alan lets her have those moments where she is both – giving importance to her family and her career in equal measure. As I mentioned in my review of the book, I think book is about family (as much as it is the case) – about rebuilding hers, the connections she’s made in her team, and the one she was born into. None of these relationships are what you expect, but it’s through these relationships that we get a clear picture of who Karen is, without having to wait for the next book in the series to figure her out. Here’s Alan on his writing, research and Karen Vail. If you could pick the brain of any author about their work, who would it be and why? I already did—here’s how it happened. After I turned in The 7th Victim, my publisher sat me down over lunch in New York City and asked me to turn FBI profiler Karen Vail into a series character. They’d had a tremendous pre-sales response to The 7th Victim, and the sales reps and buyers for Barnes & Noble and Borders wanted to know when the next Karen Vail book would be out. Although I’d never wanted to write a series, I told them I’d only do it if I could think of a way to keep Vail fresh from book to book. Once I figured that out, I agreed to do it. 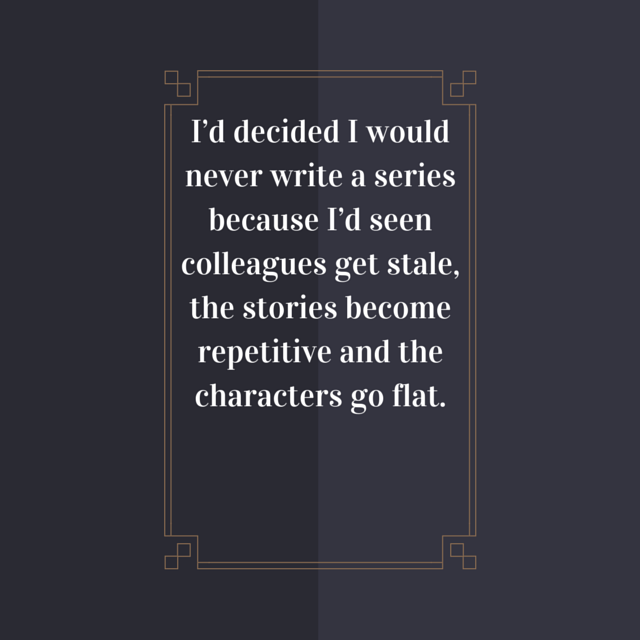 But I had no experience writing a series since I’d only written standalones to that point. I decided to ask two series authors for advice on what they learned in terms of what to do—and what not to do. First I spoke with Lee Child, whose Jack Reacher character was well-established and very successful, even nine years ago. One of the things that Lee told me was that it was best to reveal only little bits about your character in each book; dole it out over time. But I’d already violated that key piece of advice: I put everything I had into The 7th Victim—from Vail’s past to the present and everything in between. When I wrote it, I figured it would be a one-off. Series was not even in the back of my mind. I then asked Michael Connelly the same question. His Harry Bosch character was an icon. Michael said, among other things, to put everything you’ve got into the book you’re writing at the moment. Don’t hold anything back. You’ll worry about the next book next year when you sit down to work on it. I laughed and told him what Lee said—he remarked that he’d heard Lee say that before—and I was thus left with two opposing approaches. As I thought about it, however, I realized why Lee and Michael saw the situation so differently: their characters were polar opposites. Reacher was a drifter, without a physical or emotional grounding, whereas Bosch had a professional career with the LAPD; he had lasting relationships with people. It suddenly made sense why Lee could make Reacher work by telling as little as possible about him in each book: it fit the mystique. At the same time, it followed why Michael’s approach to Bosch worked: he treated him as if he were a real person, with a professional and personal grounding. Karen Vail is most like Bosch in that respect, so I had my answer…as well as an understanding of why that was the right direction to take for me. It also fit my writing philosophy of putting everything you’ve got into the novel you’re working on at the time. I don’t hold anything back. Your writing career started when your chiropractic career ended — what was the hardest and easiest thing about such a switch in careers? injury), when you were thriving in your profession and enjoying it, it’s difficult to accept. The second toughest part was that writing was so different. When I was practicing, I worked in a busy office, surrounded by staff and patients all day, every day, where I could make people who were in pain feel good; I could get them back to work; I changed their lives. There was a lot of immediate, positive feedback. Suddenly, however, I was sitting alone in a room, with virtually no social interaction, taking a few years to finish a project before any positive feedback could be experienced. I had a tough time making the adjustment (no pun intended). That said, I’ve been fortunate to have two careers where I’ve enjoyed going to work every day. And I was equally fortunate to have gotten my English degree in college. I studied writing, so from that perspective it made the career transition smoother. What was it about Karen Vail that demanded she have her own series? First, I fell in love with her as a character because she excited me a great deal. I couldn’t write her fast enough. That’s particularly surprising since I hadn’t planned anything regarding Karen Vail. I needed an FBI agent for a scene I was writing in a different novel and Vail came off my fingertips. When I finished that chapter, I realized I had to do something more with her—preferably write an entire book featuring her. While I was planning out my next novel (after False Accusations and The Hunted), I spent time at the FBI Academy with the profilers. As I got deeper into the research with them (which ultimately spanned years and continues to this day), I realized that I had the perfect “vehicle” for Vail. I started outlining a story and as it began to take shape, I knew I had something special. As to how Vail “demanded that she have her own series,” it was more the other way around. As I mentioned above, my publisher sat me down and told me the book industry’s response to Vail was exceptional—and they wanted to know when the next book in the series would be ready. 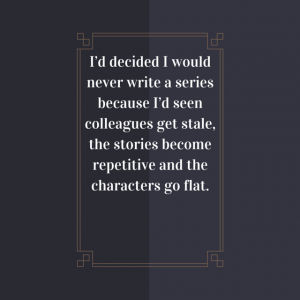 I’d decided I would never write a series because I’d seen colleagues get stale, the stories become repetitive and the characters go flat. I vowed not to let that happen to me. However, I could not ignore what my publisher was telling me. Once I figured out how to keep Karen Vail facing new challenges with each book, I plunged forward. And it’s the best thing I could’ve ever done. It’s been a hell of a ride and a terrific experience. The places I’ve gone with the series, and the places I’ve gone to do the research, have had a profound effect on my life. I recently finished The 7th Victim and thought that it was a book that was all in, and it didn’t much read like the first in a series, which usually drop hints here and there about characters’ lives – all Karen’s emotional baggage, secrets, family issues were laid bare here. 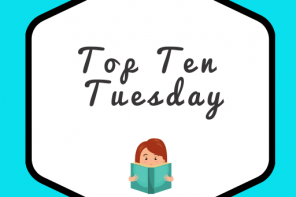 Then I read this was never intended to be the first in a series, but a one-off novel – how has that affected your approach to writing Karen in subsequent books? You’re absolutely correct. As I said earlier, it was an all-in novel. As to how it affected my approach to Vail, it really hasn’t. If anything, it ended up enhancing the character because she did go through so much in The 7th Victim. We see her in so many different situations that we get a sense of who she is as a person, what her moral grounding is like, how she’s able to succeed in a world that’s not particularly favourable toward women. When I wrote Spectrum, the sixth book in the Vail series, I decided to go back in time to 1994, Vail’s first day on the job as an NYPD patrol officer. It was a challenge writing Vail as a rookie cop, unsure of herself, the opposite of the polished law enforcement officer we’ve come to know and love. But as soon as I got into Spectrum, I had a blast because it allowed me to see Vail in an entirely new light. It also gave me another opportunity: to flesh out the cases and incidents that were alluded to in The 7th Victim as well as the other Vail novels. For example, The 7th Victim opens with a bank robbery—but it starts in the middle of things, seconds before all hell is about to break loose. In Spectrum, we go back a week in time to see what that case was all about, how it unfolded, and why she was at that bank at that moment in time. 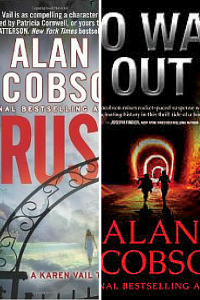 It also allowed me to give perspective to some of the cases we only glimpsed in the other Vail novels. From a character point of view, in The 7th Victim we meet Deacon, Vail’s soon-to-be ex-husband. He’s not a pleasant guy—and it’s a less than pleasant situation. However, that’s not how their relationship always was. Spectrum allowed me to go back to the night they met and watch them go through courting and pregnancy together—while Vail battles her demons on the job and an elusive serial killer in Manhattan. Her relationship with Deacon is a minor point in the context of the story, but in Karen Vail’s universe it gave us insight into her first relationship—while she deals with a new relationship in the present time. Looking back, is there anything that you would change in regards to The 7th Victim? I’m very pleased with it. It took me years to research and write and it gives us tremendous insight into Vail; it’s got twists galore; it provides us with a keen understanding of behavioural analysis; and it introduces several terrific characters who return in many of my future novels. (In fact, the next Vail novel, number seven, will bring back a character from The 7th Victim that we haven’t seen since.) The depth of The 7th Victim gave me a fertile field in which to plant crops that have blossomed in the rest of the Vail series. What’s more, one of the founding fathers of the FBI’s Behavioural Analysis Unit called The 7th Victim “a must-read book,” one that “sets a new standard for serial killer novels.” How could I find fault with a novel that scored that kind of praise? I looked through The 7th Victim when the screenplay was being written, so I got a chance to revisit it to some extent (the movie project has since fallen through). While I think every author can re-read one of his books years later and find words here and there that he’d like to change, in terms of global edits, nothing comes to mind. And since I’ve continued to build on that in terms of other books in the series, I think The 7th Victim has worked out quite well as it stands. What is the most important difference in writing your male and female lead characters in your novels? The obvious difference is that females and males think differently. 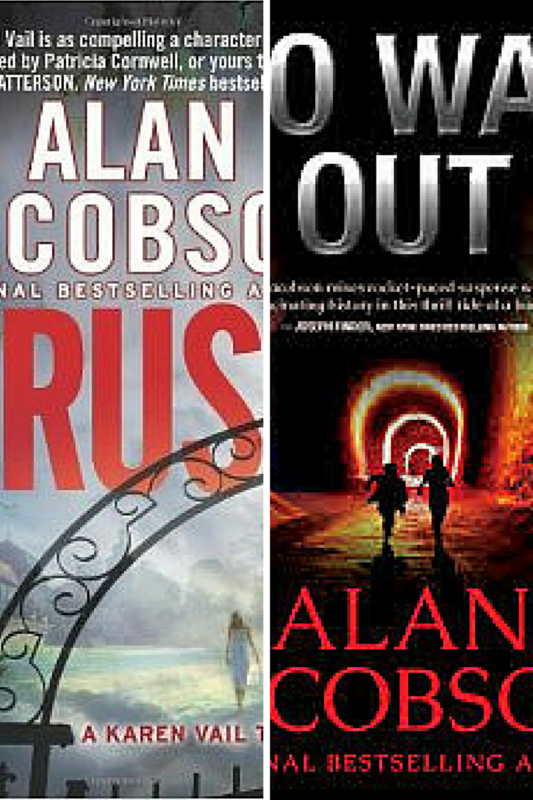 They bring different sensibilities to their role as law enforcement officers, and in the case of the FBI (for the Vail novels) and covert/black ops (for the OPSIG Team Black novels), you have women who are looked at sceptically in terms of their ability to do a job that’s in a predominantly male profession. In talking with women who do this work in real life, many feel a pressure to continually prove themselves. While it did figure a bit in The 7th Victim, it’s only come up rarely in the series since. That said, Vail and many of the other women in my novels (Roxxann Dixon in particular) have female issues that they deal with—and they have the kinds of thoughts, and discussions with each other, that women have. In Crush, Vail is seated in the major crimes task force room when Dixon walks in. Vail is an attractive woman but Dixon is drop-dead gorgeous and physically fit. All the male heads turn toward her—and Vail immediately feels animosity toward Dixon. It’s a natural reaction and it just sort of happened when I was writing the scene; it wasn’t planned. What comes later was also unexpected—but my editor loved it all, as did I, and it resulted in a long-lasting relationship between the two women. It never would’ve happened between two men or a man and a woman. Bottom line is that as with any main (or significant) character in your novels, they should not be interchangeable. They are in the position they are in, doing what they’re doing, for a reason. You should not be able to substitute in a different gender without having to do some rewriting. If you could substitute a male for your female, something is missing. 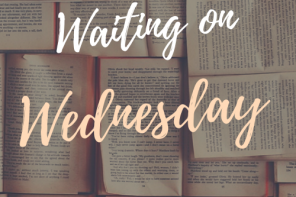 Do you have an overall plan for the various series you write, or does each title just begin with an idea that grabs you? my thoughts. And while I have an overall sense as to where I’m going with the Vail and OPSIG series (and their characters), I’m flexible because my plans can, and do, change for a variety of reasons. I would have to say that the bigger factor is the idea—actually, the idea as it relates to my characters. 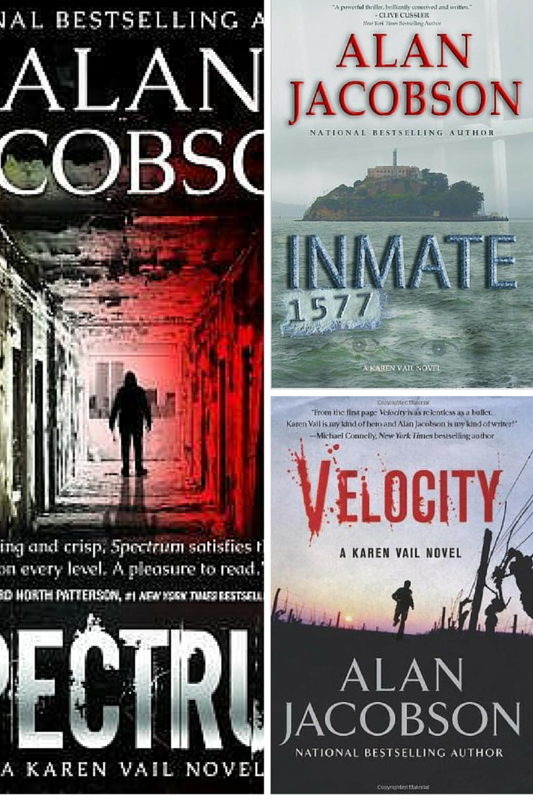 With Inmate 1577, I walked into my office one morning and “Karen Vail on Alcatraz” popped into my head. I jotted the idea down, along with some thoughts on what the story would be. Although I wasn’t actually working on developing it, each day more details came to me. As the concept took shape and became a story, I realized that the work I’d done with the profiling unit gave me knowledge that would make this book unique; very few people knew what I knew. In addition, there were aspects of Vail’s background (expanded on in Spectrum) that would make a nice tie-in to the killer. However, I’d just finished writing Hard Target (OPSIG Team Black #2) and was planning to start writing a different story that I’d been outlining. But when the idea of Karen Vail on Alcatraz came to me, I couldn’t stop thinking about it. 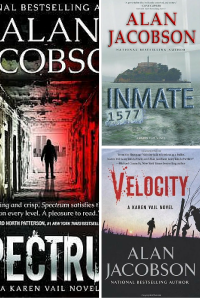 I shelved the other book for the moment and started writing Inmate 1577. In this case, the idea—as it related to specifically to Karen Vail’s skills and past experiences—is what determined the story I ended up writing. It grabbed me and I loved it so much that I had to write it. Ultimately, Inmate 1577 gave me some terrific things for the Vail universe that I came back to in Spectrum. It’s a rich novel that is among my fans’ favourites—yet it was not part of any kind of overall series plan. It came out of nowhere. Your relationship with the FBI, you’ve said, has proven essential to your writing, but for an author delving into a world that is foreign to him or her, what in your opinion should someone keep uppermost in their mind to avoid getting overwhelmed or side-tracked, for instance? As in everything, break it up into manageable units: concentrate on the story and characters first, determine what it is that you need to know about, and then set out a plan for how you’re going to attack the project. 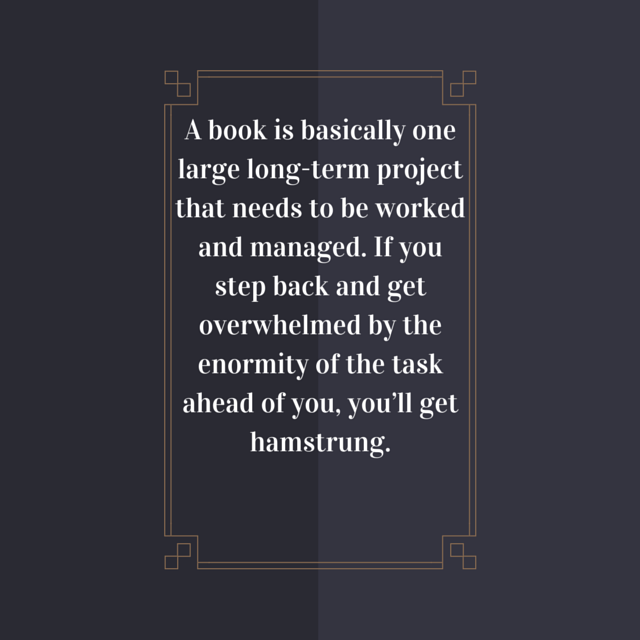 A book is basically one large long-term project that needs to be worked and managed. 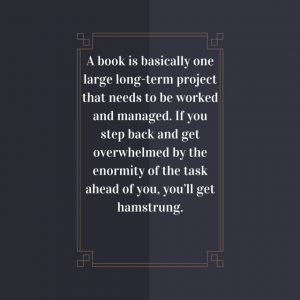 If you step back and get overwhelmed by the enormity of the task ahead of you, you’ll get hamstrung. So break it up into pieces and do one piece at a time, like you’re building a structure from the ground up. First construct a firm foundation (the idea/outline), then add floors one at a time (the chapters). If you keep at it, you’ll eventually have a multi-story edifice. Set a writing schedule and keep to it. If you write a page a day, you’ll have a draft of a novel in a 12-13 months. Once you have your story set—it needn’t be final because it should be a dynamic thing: allow yourself the freedom to modify and create on the fly—plan out how you’re going to approach your research. Respect the time of the experts you’re going to be speaking with. Have your questions ready and listen to what they’re saying because sometimes their information will give you ideas you hadn’t thought of. Be sure to ask if it’s okay to follow up with some additional questions. While you don’t want to overwhelm them (they may disappear! ), once you start writing you’ll encounter things you didn’t know you should have asked about. What has surprised you about how publishing has changed since you published your first novel? Wow—now there’s a question that can encompass an hour-long lecture. My publishing career has encompassed 21 years, 18 of those as a published author. I’ve seen a complete upheaval in the industry that’s resulted in a total remake of the publishing model. That said, none of it has been a surprise to me. Remember, I came from running my own business. When I switched careers I purchased a dozen books to learn about the industry that I was entering. I wanted to know how it worked—the rules of the game, so to speak. What I discovered was one of the most dysfunctional business models I could imagine. It’d be tough to design a more inefficient paradigm if I tried. As a result, when stresses came, it was inevitable that the industry was going to have significant problems. The stresses: a steep rise in commodity and expense costs (paper, ink, shipping, fuel, warehousing/real estate) that resulted in major mergers (reducing the number of viable publishers); the rise of the internet; the explosion of videogame platforms and social networking (all of which caused people to read less); and the financial collapse, which contributed to the failure of nearly half of the brick and mortar bookseller marketplace (Borders). 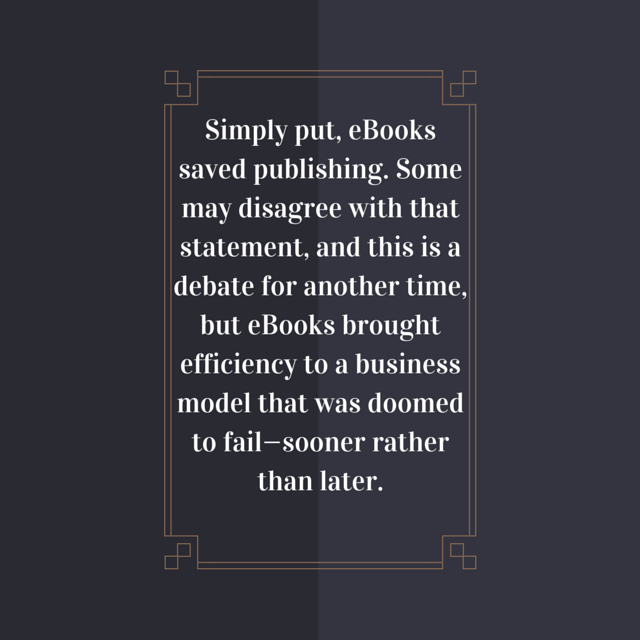 Simply put, eBooks saved publishing. 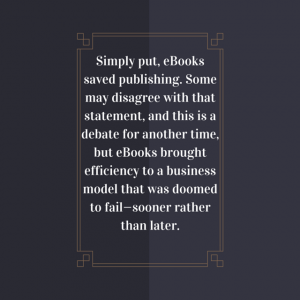 Some may disagree with that statement, and this is a debate for another time, but eBooks brought efficiency to a business model that was doomed to fail—sooner rather than later. Again, none of this surprised me. I predicted much of it, though there’s one thing that I did not foresee: the impact of the financial collapse on book buying. I’d thought reading was a relatively low cost form of entertainment and that it could see a resurgence in readership. The opposite occurred. It wasn’t until eBooks caught on en masse did readership (and literacy rates), improve. Again, had it not been for eBooks, the industry would’ve faced a much bleaker future. What’s in store for you in 2015? 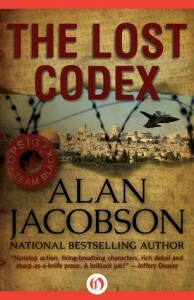 I just handed in my latest novel, The Lost Codex, an international thriller that Jeffery Deaver called “brilliant” and Douglas Preston described as “an enthralling mix of ancient history and modern terrorism, an outstanding novel.” The Lost Codex is book #3 in the OPSIG Team Black series, which follows a group of special ops agents on “black missions” that no one can know about. Briefly: In 1953, a rare ancient manuscript is discovered a mile from the Dead Sea. Six decades later it stands at the heart of a geopolitical battle that threatens to leave untold dead from Washington to Paris. 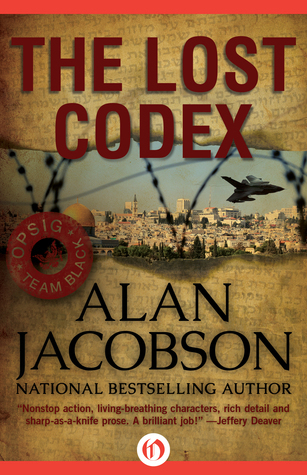 The Lost Codex comes out on November 3. For a more detailed story description, check out the book’s page. I’m about to start writing Karen Vail #7 (I can’t reveal the title yet), but I envision it having the feel of The 7th Victim in terms of suspense and intensity, with some great twists. I’m also working on a nonfiction book with Mark Safarik, a buddy of mine (one of the FBI profilers I’ve worked with for 21 years). It covers his career and 13 of the most interesting cases he handled. We’ve been working on it for a couple of years, so hopefully 2015 will be the year we finish it! Finally, I’d be remiss if I didn’t tell your readers about the free eBook I co-authored with Agent Safarik on personal safety. If you go to my website at www.alanjacobson.com and sign up for my (occasionally published) newsletter, you’ll get the link to download the eBook. We highly recommend it for men, women, and teens. Again, it’s free. Thank you Alan for your time! Guys, what did you think? Is Karen Vail your cup of tea? What other books about profilers have you read?